Borders police are sending letters to the parents of all schoolchildren in Galashiels in a bid to raise awareness of increased levels of youth antisocial behaviour in the town. The move is revealed in a report by divisional police commander Chief Superintendent Ivor Marshall for tomorrow’s meeting of the Scottish Borders Police, Fire and Safer Communities Board in Newtown. 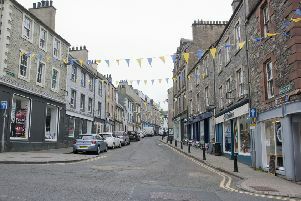 The issue was also highlighted at last week’s meeting of Galashiels Community Council, when former policeman John Hazle, now a community councillor, said he had witnessed “disgusting behaviour” from pupils who drop litter on the street and put themselves in danger when crossing roads. CS Marshall explains that between April and December last year, his force dealt with 3,849 incidents of antisocial behaviour in the region – up by 134 (3.6%) on the corresponding period of 2015. “Problems with youths, in particular in Galashiels and Hawick in December, have increased the number of reported incidents,” he states. “Initiatives are in place to address these issues and a multi-agency approach is being pursued. “Letters are being sent to parents, via the schools in Galashiels, to raise awareness of the current antisocial behaviour issues regarding youths in the area. Board members will hear that the number of common assaults recorded in the region over the same period rose by 19 – from 575 to 594. He will also report that the number of “hate crimes” fell over the nine months by 18% from 66 to 54. Most of these incidents (36) were race-related with the ethnicity of the majority of victims being described as “white European”. The others were motivated by disability (seven incidents), homophobia (six), religious hatred (three), transgender (one) and gender (one).